People use the Left/Right approach out of habit, but it leads to confusion. For example, Fascism is often placed on the Right and Socialism on the Left. Yet Fascism is “National” Socialism. Indeed, the left/Right scale is not a scale at all, just an obsolete reference to the seating arrangement of the French Assembly in the 1790s. In 1970, Denver advertising executive David Nolan invented a better approach. He divided human action into two categories. The “Economic” category includes what you do as a producer and consumer. These are your actions that can be described in money. Examples are earning a wage, buying a car, renting a motorhome. The “Civil” (or personal) category includes what you do in relationships and expresing yourself. These actions are NOT measured in money. Examples are the way you worship God, or don’t; what books or magazines give you pleasure; your personal tradeoffs between today's fun and tomorrow's health. The Bill of Rights is aimed at your freedoms in this category. Left/Liberals like personal choice in civil matters and central decision-making in economics. They want government to serve the disadvantaged and promote equality. Left/Liberals place high value on good intentions. They accept diversity in social behavior but seek more equality in economics. They work with Libertarians in defending civil liberties and with Socialists in advancing economic central planning. Right/Conservatives like personal choice in economics and central decision-making in civil matters. They want government to defend the community from threats to it's moral fiber. Right/Conservatives place high value on laws and legislation. They accept diversity in economics but seek similarity in social behavior. They work with Libertarians in defending economic freedoms and with Populists in enforcing community standards in social matters. Socialists & Populists favor central decision-making in both civil and economic matters. They believe the needs of the individual are subordinate to the needs of society. They want government to “correct wrongs.” While they strongly differ on particular programs, both prefer equality in economic and personal matters. 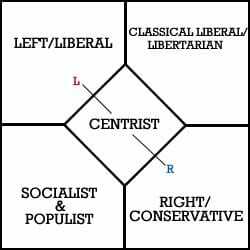 Centrists favor selective governmental intervention and temporary affiliations with others. They take a strong stance on few issues, prefering the middle position in most matters. Centrists emphasize practical solutions to current public issues.